Will your supply chain survive the twists and turns of the global economy? Can it deliver mission-critical supplies and services in the face of disaster or other business interruption? A resilient supply chain can do those things and more. 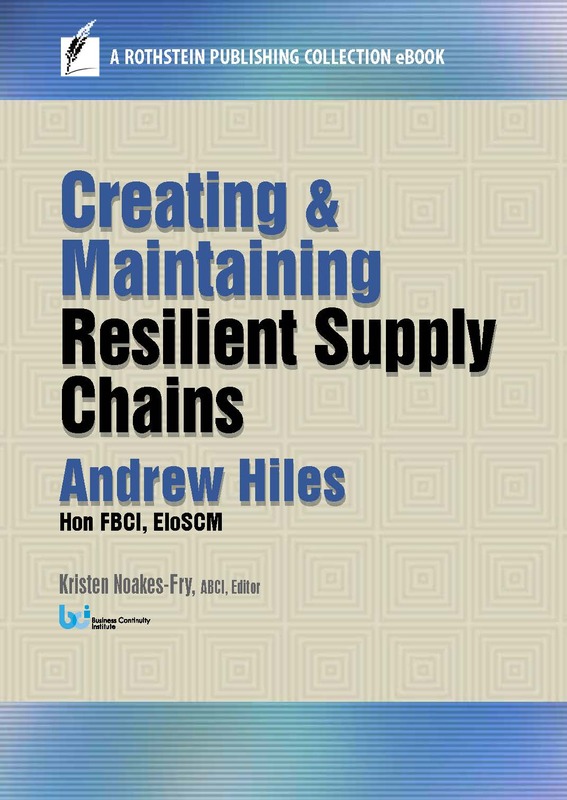 In Creating and Maintaining Resilient Supply Chains, global expert Andrew Hiles applies the principles of risk and business continuity to enable a reliable flow of materials and information that is a “win” for everyone involved. Attracting media attention is surprisingly easy – you just want it to be the right kind! If an event causes the phone to ring and TV cameras to appear in your lobby, you need confidence that the people who happen to be at your worksite that day are prepared. That’s easy if everyone – executives, PR, managers, and employees – is familiar with Jim Lukaszewski’s sure-fire methods for handling the media! Is security management changing so fast that you can’t keep up? Perhaps it seems like those traditional best practices in security no longer work? One answer might be that you need better best practices! In their new book, The Manager’s Guide to Enterprise Security Risk Management: Essentials of Risk-Based Security, two experienced professionals introduce ESRM. Their practical, organization-wide, integrated approach redefines the securing of an organization’s people and assets from being task-based to being risk-based. Avoid being blindsided by an unexpected emergency or crisis in the workplace – violence, natural disaster, or worse! Bruce Blythe’s The Manager’s Guide to Quick Response in a Crisis: Effective Action in an Emergency offers the time-tested skills that prepare you to act effectively – on behalf of yourself and your co-workers – in the face of threat and chaos. Blythe uses real-world case studies, examples, and checklists to help you be the top-notch leader the situation requires. As a manager, you’re aware of terrorist acts, are considering the risks, but sense that you need more background. How might terrorism occur? How is it part of risk and threat planning? What insurance strategies might protect your company from financial loss? In a few short chapters, The Manager’s Guide to Terrorism, Risk, and Insurance: Essentials for Today’™s Business fills in the blanks for you. You designed your Business Continuity Plan to keep your business in business regardless of the forces of man and nature. But how do you know that the plan really works? Few companies can afford the recommended full-scale exercises several times a year. In The Manager’s Guide to Business Continuity Exercises, Jim Burtles, an internationally known expert, details the options for conducting a range of tests and exercises to keep your plan effective and up to date. As a manager, you can usually handle disruptive employees. But sometimes, their emotional states foster workplace tension, even making them a danger to others. Your own confidence is at risk. In The Manager’s Guide to Bullies in the Workplace: Coping with Emotional Terrorists, noted counselor Dr. Vali Hawkins Mitchell gives you sensible advice for keeping the bully from dominating the workgroup and destroying productivity – and maintaining your own healthy emotional balance at the same time. When it’s not just a drill, you need to get it right the first time. If an emergency alert sounds, are you ready to take charge and get everyone out of the office, theater, classroom, or store safely? In Introduction to Emergency Evacuation: Getting Everybody Out When it Counts, Jim Burtles explains the practical basics of understanding your site, planning escape routes, and providing for people with special needs. When minutes count, you will be ready to take action!